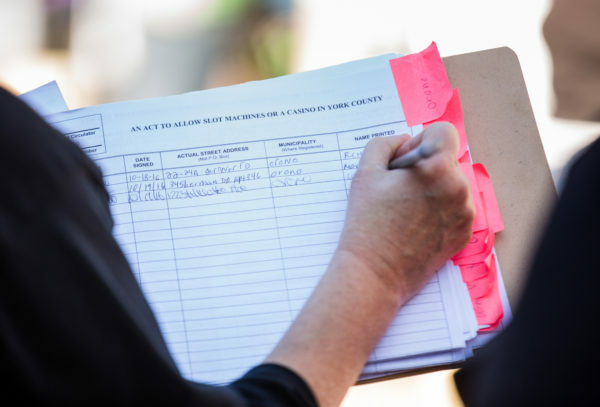 A person signs a petition that is related to "An Act to Allow Slot Mchines or a Casino in York County" on Oct. 19, 2016 in Bangor. The sister of controversial gambling developer Shawn Scott said she’s stepping down from the embattled campaign to convince voters to allow a casino in York County. Lisa Scott’s announcement came the same day that the Maine Ethics Commission continued its investigation into financial backing of a casino campaign that has spent more than $4 million just to get on the ballot. The commission has subpoenaed Lisa Scott’s bank records and correspondence she’s had with an array of political action committees that are funding the campaign. Up until April, Lisa Scott appeared as the sole funder of an operation that has drawn scrutiny from state lawmakers and the ethics commission. Pressure from the commission, lawmakers and press scrutiny prompted Scott to reveal her other funding sources: a web of domestic and offshore investment firms, most of which are connected to her brother, Shawn Scott. Shawn Scott first brought gambling to Maine in 2003 when he convinced voters to approve a racetrack and slots parlor in Bangor. He’s left a trail of litigation ever since, and sold the Bangor gambling operation for a reported $55 million. The York County casino appears as Question 1 on the November ballot. If approved by voters, Shawn Scott will be the only person who can own the license for the facility, although nothing in the ballot question prohibits him from selling the license after the project is built at an undisclosed location. From a practical standpoint, Lisa Scott’s involvement has been limited to acting as a pass-through agent, allowing the previously undisclosed investment firms connected to her brother to funnel money through corporations controlled by her and to the Horseracing Jobs Fairness ballot question committee. The ballot initiative has recently transitioned to a more traditional campaign. Progress Maine, a ballot question committee formed in mid-August, is expected to become the primary campaign apparatus and it has hired the same consulting firm that last year convinced British voters to leave the European Union. Michael Sherry, a spokesman for Progress Maine, said Shawn Scott and another partner will be involved in the campaign.